Modesti has been at Beacon Baptist Church Daycare and Raleigh Christian Academy for twenty-one years. She and her husband moved to Raleigh in 1996 with their two year old son, now a graduate of RCA. Beginning as a preschool teacher, Modesti has also taught second, third, and fourth grades. Mrs. Cavenaugh stepped in as our Early Childhood Director in 2005. Quanda Hayes joined our ministry in the fall of 1996 as a three-year-old teacher. She is currently a lead teacher in our two-year-old class. She and her husband have two daughters who have both grown up through our sister ministry, Raleigh Christian Academy. Mrs. Hayes' faithfulness makes her a tremendous asset to our ministry. Courtney Cerezo has been in Early Childhood for six years. She has recently joined our ministry on a full-time basis and servers as one of our teachers in our three-year-old classroom. Mrs. Torres has been a teacher in our two-year-old class since the fall of 2004. 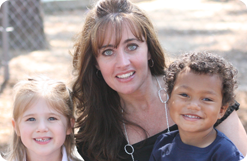 She and her husband have three sons at Raleigh Christian Academy. Mrs. Torres brings joy to her class with her enthusiasm and love for children. In 2006, Mrs. Maribel and her husband joined our Spanish ministry to assist the pastor and work with the youth. Mrs. Maribel is currently a teacher in our Toddler class. She brings a sweet and calming spirit to her classroom which gives each family a sense of peace when bringing their child to our daycare. Brandi Sarver is a graduate of Raliegh Christian Academy. She joined our ministry as a teacher in 2014 and currently serves our 3s class. Brandi and her husband have two daughters. In 2001, Mrs. Jennifer joined our staff in a part-time/substitute position. She has been a full-time teacher since 2010 and is currently a lead teacher in our three-year-old class. She and her husband have three children, the oldest of which recently graduated from Raleigh Christian Academy. Mrs. Jennifer has a humble spirit and is a wonderful asset to our ministry. Mrs. Van Reenen joined our ministry in the fall of 2008. She is currently a teacher in the K4 (preschool) class. She and her husband have two sons. Her positive outlook on life is evident in her teaching style, making learning fun and adventurous. Mrs. Kwanya started as a substitute teacher and currently serves in our one-year-old classroom. Her love for the Lord is evident from the minute you meet her. She and her husband have one daughter.